Don’t buy anything unless it’s urgent - yes, it’s a flexible definition and relates more to fixed goods than consumables. Focus on spending time with, and giving to, others. In March, May and July, I published my first three updates. Based on these, my average so far is a “B”. Not bad, but I’ve vowed I can do better. Have I? Let’s take a look. Note to all my non-Canadian readers: All costs below are shown in Canadian dollars. Current exchange rate as of this writing is: 0.77 US or 0.49 British Pound for $1.00 Canadian. The summer period involved some significant differences to the usual activities I've reported so far in these updates. July and August involve a lot of fruit picking (mostly Saskatoon berries, raspberries, blackberries and apples) and we had a visit from my Austin-based friend Michelle (aka my travel buddy for 2014's safari adventure), which meant more great food in the house and far more outings in our fair city than usual (here's a partial list: the St. Norbert's Farmer's Market, the Canadian Museum for Human Rights, Heartland Archery and a visit to the International Peace Garden). • Groceries ($2,383.47, 12% more than the last 2-month period and 56% of our overall spend): Yup, big bill...again and we, our two greyhounds and our guests ate all of it. We ate and hosted very well, enjoying delicacies such as bison, elk and other venison. I did think it would come down this period because of the plentiful berries and fruit in the yard, but we ended up freezing most of this produce. Despite the spend, I managed to reduce the amount of dry goods in our pantry, though our freezer is now fatter, thanks to over 20lbs of berries and baked apple crisps waiting for the next 20+ family member get together this September. I call that a "good problem" of extra food in the house thanks to Mother Nature. Not much change in the freezer, as the turkey, whole chicken, ground beef and veggies were replaced with berries from our garden, and apple crisps and chicken legs & thighs for an upcoming family get together. At least we didn't increase the amount of freezer space used! The pantry is where I managed to make progress. You can tell by the stacks of empty containers on the top shelf and on the middle right. The big bags below the shelving are dog food for our foster that we were able to procure at a large one-time discount, so we stocked up. • Personal Growth and Relationships ($1050.88, which is a third of what we spent last period, half of what we spent in update #2 and represents 25% of our overall spend): this category includes, professional development courses, conferences and going out with friends and family. Note: It would have been considerably more if we included the cost of food for hosting a friends and family in our home, but I keep that in "groceries" because splitting it out is not practical. • Entertainment ($30.95): Netflix and two documentaries from iTunes. The two documentaries were definitely worth it and at one of them should really be considered education/personal growth. I did goof though in having to rent one of the documentaries a second time to enable Mr. F2P to finish watching it. Curious as to what these were? Money for Nothing and Going Clear. I recommend them both. Note: I included the activities we did with my Austin friend in personal growth and relationships, which included the local attractions and activities I mentioned above. Some might consider these entertainment. Amazon purchases at $29.98, which excludes $37.87 in book purchases I classified as personal growth (more on that below). I am very pleased that over 80% of our purchases went to what we value most: good quality food, personal growth, relationships and fun. Incidentally, that's more than twice what we spend on housing and transportation...combined! I made a mistake this summer: signing up for the free 30-day Amazon Prime trial. Not because I missed the opt out deadline but because there's an implicit pressure to purchase while the 2-day free shipping is available. The result was the purchase of a few iPhone accessories (car charger and adapter) that I could have done without for another while. It's a small $30 mistake but I can tell you that a lot of stuff was making it into the shopping cart that shouldn't have. It was a little scary to see that the pull to maximize use of a "free" trial could easily have been even more expensive and, worse, unnecessary. That's good old loss aversion at play. I made a required and an impulse purchase at the same time. The kitchen wares purchase of $33.88 mentioned above was for a salad dressing jar (impulse) and for an oven mitt (necessity). After burning myself twice with 20-year-old oven mitts over the last few months, I decided the investment in a new oven mitt was worth it. I bought just one to try it out, as it was expensive. If I really like it, I may spring for a second to replace the set that's ready for the garbage. As for using what we have, I've fixed the vacuum head yet again this year (sticky tape is wonderful). It's on its last legs and we'll be getting another one soon, but I want to see just how long it can last. Brought three boxes of clothing and miscellaneous items to the Thrift Store. Woohoo! 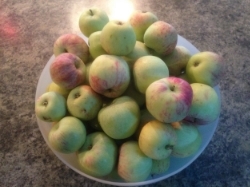 Gave apples from our tree to a local mission. Exchanged berries for veggies with a friend. 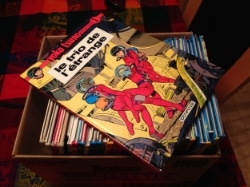 Gave away my collection of Yoko Tsuno and a bunch of other comics to my friend's children. I know they'll get far more enjoyment from them than I can. I'm really pleased about this gift because it was hard to do, given I felt I was giving away a piece of my childhood, but it made me feel great in the end. I'm going to focus more in this area for the next period but more definitely left the house than previous periods. Hosted a get together of like-minded FI seekers. Had coffee/lunches and other outings with friends. As mentioned above, hosted my Austin friend for a week of outings, which was tremendous fun. Hosted a BBQ and two movie nights for some of our friends. We're also looking forward to spending more time together next period (other than our daily dog walking), thanks to a trip to Vancouver and a few events. Birthday gift: This year, I decided I wanted nothing but water for my birthday. No cake, no cards, no flowers, no dinner...just water. Here's the related post if you want to know more about charity:water and/or if you'd like to make a donation. Volunteering: The 1/2-day per week of volunteering I've been doing at a local shelter's gym continues to be going well. I've signed up to the end of the year for now and we'll go from there. It feels great to help people improve their situation through physical activity. Fostering: We're still fostering Beezie the grey/coyote hound mix. Fostering is really quite fun, especially when you have a great dog like Beezie. Overall score for the 4th update? I get a "B" this time around because I feel I've slipped. My eye's off the ball a bit. • I give myself a "C" for the "not buying anything unless it's urgent" category, mostly because of the Amazon Prime trial purchases. Just plain dumb and I know better. • I give myself a "C" again for the "using what we have" category because I know I could have made a bigger dent in our pantry and freezer but didn't want to. I made a decision to offer the best of what my little part of the world has to offer when it comes to food and just didn't care to try to reduce our food stores as much as I could have. • I give myself an "A+" in the "giving" category. I've done more in one period than I have for a long time and this is the area where I wanted to improve the most. If I keep doing as well as I did in these summer months, I'll be more than satisfied. This makes my overall score a "B-". I still feel I need to give away more stuff and use up more of what we have on hand. We'll see if I can make more headway in the September/October timeframe. Are you trying to build your giving/purging/connecting muscle? How's it going?